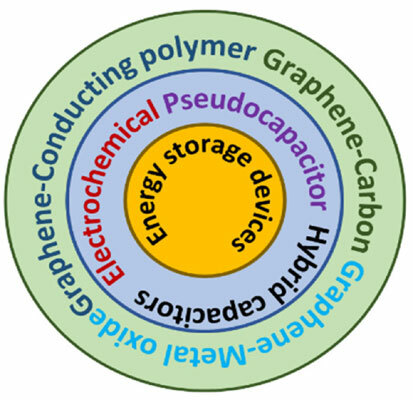 Background: A tremendous amount of research work has been done over the past decade to explore the potential of graphene for energy applications including its use in supercapacitors because of its unique characteristics such as: novel charge transport behavior, superior electrical and thermal conductivity, good chemical stability, outstanding mechanical behavior, and above all its tunable interlayer spacing. A variety of ions has intercalated into the graphene layers without damaging its structure suggesting structural stability and durability for energy storage applications. Although the energy storage capacity of pure graphene is low, its charge storage capacity can be improved by synthesizing nanocomposites of graphene with polymers, metal oxides, and carbon-based materials. Nanocomposites with conducting polymers such as polyaniline, polypyrrole and polythiophenes can provide various nanostructures with improved electrochemical properties compared to pure graphene and conducting polymers. On the other hand, metal oxides provide ultra-high faradic capacitive performance and othercarbon based materials help in creating complex nano-structural morphology for enhanced energy storage capacity. Objective: The purpose of this review article is to provide both a comprehensive and critical scientific progress that has so far been made on nanocomposites of graphene. We will especially focus on topics such as the supercapacitive performance in terms of specific capacitance, energy density, power density, cycling life, rate capability and the working principles of supercapacitive nanocomposites. Keywords: Carbon nanotubes, conducting polymers, graphene, metal oxides, reduced graphene oxide, supercapacitor. Keywords:Carbon nanotubes, conducting polymers, graphene, metal oxides, reduced graphene oxide, supercapacitor. Abstract:Background: A tremendous amount of research work has been done over the past decade to explore the potential of graphene for energy applications including its use in supercapacitors because of its unique characteristics such as: novel charge transport behavior, superior electrical and thermal conductivity, good chemical stability, outstanding mechanical behavior, and above all its tunable interlayer spacing. A variety of ions has intercalated into the graphene layers without damaging its structure suggesting structural stability and durability for energy storage applications. Although the energy storage capacity of pure graphene is low, its charge storage capacity can be improved by synthesizing nanocomposites of graphene with polymers, metal oxides, and carbon-based materials. Nanocomposites with conducting polymers such as polyaniline, polypyrrole and polythiophenes can provide various nanostructures with improved electrochemical properties compared to pure graphene and conducting polymers. On the other hand, metal oxides provide ultra-high faradic capacitive performance and othercarbon based materials help in creating complex nano-structural morphology for enhanced energy storage capacity.